Pr Buno Lacarelle, Pharm.D., Ph.D., is professor in toxicology at Aix Marseille University. 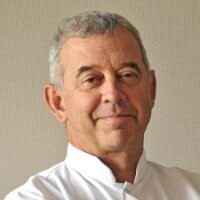 Pr Lacarelle is the Head of the Pharmacokinetics and Toxicology Laboratory at the School of Pharmacy of Marseille, the Head of the Clinical Pharmacokinetics Laboratory of the La Timone University Hospital of Marseille, and the Head of the Biology Pole at the Assistance Publique Hôpitaux de Marseille. Pr Lacarelle has strong records in therapeutic drug monitoring and pharmacogenetics of anticancer agents and teaches toxicology and toxicokinetics at the school of pharmacy of Marseille.